B stands for a redstone block, R stands for a repeater, and C stands for a command block. For specifics, this is my Deathmatch system in a vanilla Survival Games map. 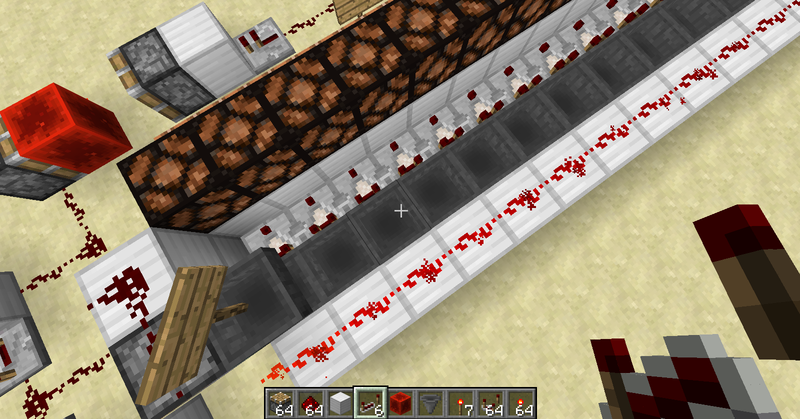 When the minute is over, it reaches command blocks which teleport everyone to one location. The admin in the match uses a command button in a /tellraw command to start the countdown for Deathmatch when (s)he deems it appropriate - this command sets a redstone block as the input. After it is placed, it remains placed for the rest of the game -- but I want to be able to destroy it while not stopping the minute countdown for debugging purposes. And, as it's a countdown, it needs to be able to send out a signal every second to command blocks for stuff like "15 more seconds until Deathmatch!" Summary: I am looking for a delay as opposed to a timer. I do not want a signal that loops and am not looking for a necessarily long delay, I just want an accurate delay that is more efficient than using repeaters AND can support gradual output (IE at half delay an output, at three quarters, etc...) Hooking a timer up to an AND gate with the input won't work as far as I know (if you know a way please tell) because if the timer was half-passed when the input was given, then the "delay" would be half the intended time. And removing the input signal should NOT stop the delay from continuing. It also needs to be silent, as it is close to the surface, and non-laggy (no super-quick repeater loops). 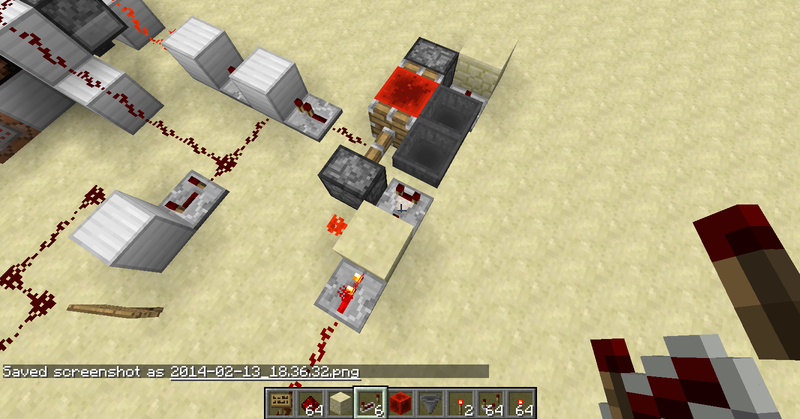 I am asking for a very specific redstone circuit, I know. You could also use a bunch of T-FlipFlops which toggle on/off every time they get a signal. If you put them in a row, it will take much longer until the last one is toggled. (This is a binary counter) In fact, any additional T-FlipFlop will need double the time until it's re-activated. As it turns out, the circuit you pretty much can plug a hopper timer into any place you have looping repeaters. It's a very versatile circuit. In this case, you've got a series of command blocks that pulse every given amount of time. If that given amount of time is constant, you can use a hopper timer set to the appropriate delay (it might take some experimentation, but I found that 7 items we pretty close to 2.5 seconds on, 2.5 seconds off). From there, (I assume this is your test world that MBraedley posted in the comments), you've got some good ideas on how to use a clock like this to drive the circuit (I honestly would not have thought of doing it that way). For the sake of people who have this type of question in the future, I'm going to go ahead and break that part down. Essentially, this circuit takes the clock provided by the timer of your choice (in this case, a hopper timer), and sends it sequentially down the line by locking and unlocking a series of hoppers. 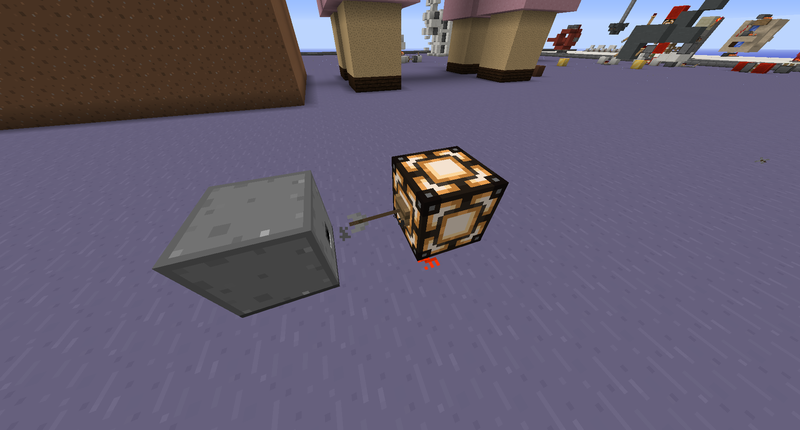 When the timer starts, an item is dropped into the hopper system, and the first command block triggers. This item goes down the line until it reaches the end. When it reaches the end, it resets a RS-NOR latch that locks the hopper timer. Also I suggest putting up /spreadplayers but I'm not sure how. where 120 means 120 seconds. Tested this for 1.11 Minecraft version. Will this Instant Repeater design work reliably? 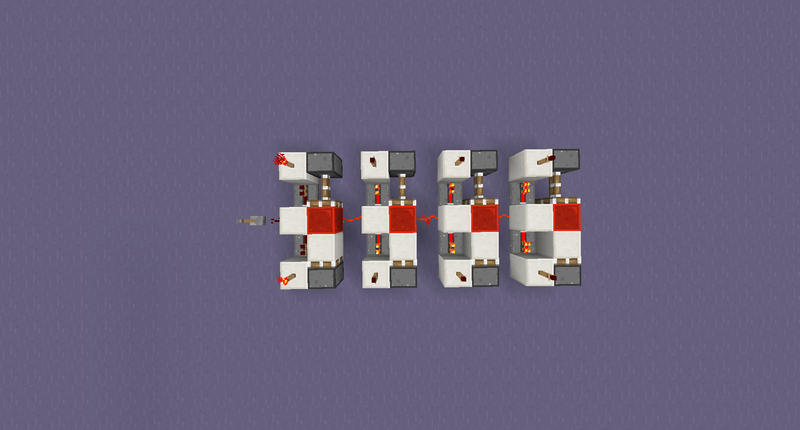 Is there any way to build a circuit that acts identically to a redstone repeater? Tick delay caused by Hoppers?